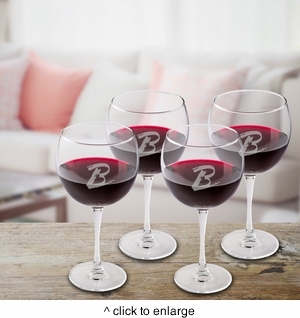 DETAILS: Specially designed for that favorite red vintage, our quartet of four personalized red wine glasses will please the wine connoisseur in your life. Attractively personalized with a modern script-style monogram, these glasses are delicate but sturdy and make a great bridesmaid or housewarming gift. Cheers! MARKETING: Wine glasses, wine gifts for the wine lover.